The trailer for R.I.P.D. has come and gone, and while it feels wholly familiar with a vibe similar to Men in Black, and director Robert Schwentke's previously action comedy RED, it still looks like it could be some summer fun. 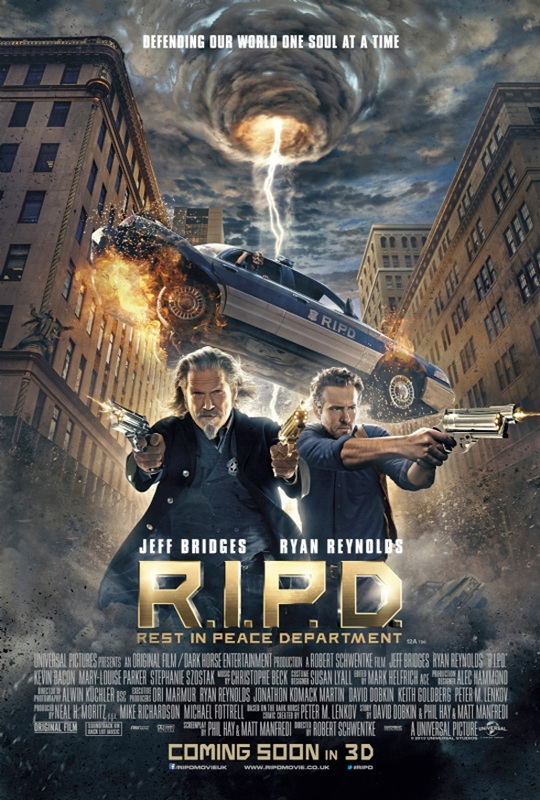 Now a new poster has arrived throwing a heroic Jeff Bridges and Ryan Reynolds into the midst of some serious chaos downtown. There's a lightning tornado, some four-armed monster on a building ledge and someone seemingly trapped in that flaming police car. Plus that tagline isn't too far off from "Protecting the Earth from the scum of the universe." We're still interested to see how this plays out. This movie looks bad... and the people who made this should feel bad. This movie looks terrible, i can't stand the see Bridge's look. it's like a self parody. I will avoid this film and keep my good memories of Jeff as Rooster Cogburn. Looks amazing dunno what everyone is one about. Because it has all the hallmarks of being a bomb. I seem to like movies like that for some reason. It looks and sounds like a Sega Genesis game from 1991. Trailer was terrible. I'm predicting a huge flop based on this poster alone.